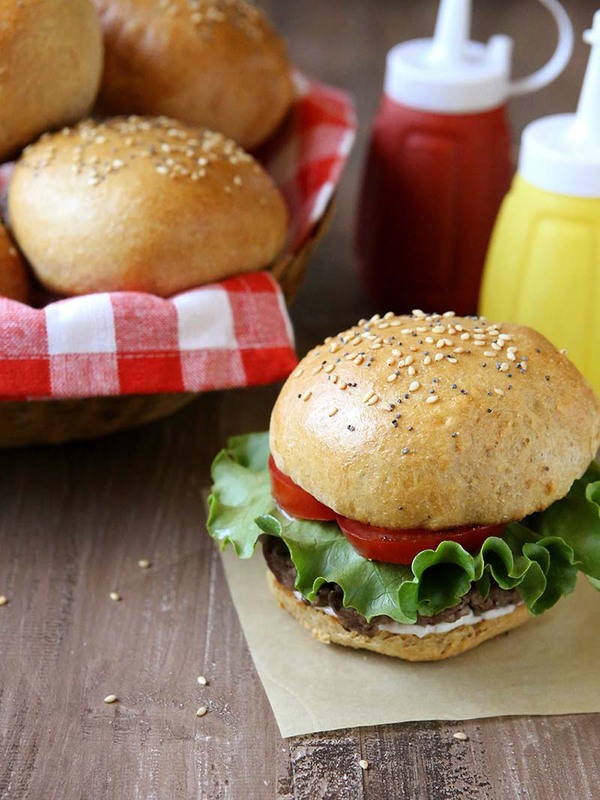 Homemade hamburger buns made with 100% whole wheat flour. Perfect for grilling season. In the bowl of a stand mixer fitted with a dough hook (or in a large bowl if planning to mix by hand), combine 2½ cups of the whole wheat pastry flour, yeast and salt. Add the warm water mixture, followed by the beaten eggs, mixing on low speed until incorporated. Add the remaining flour ¼ cup at a time while mixing on medium low speed until dough almost clears the bowl and is only a slightly sticky to the touch (It's okay if some dough sticks to your fingers). You may not need all of the remaining flour, or you may need more than is called for. When ready to bake, preheat oven to 400°F. Brush buns with egg wash and sprinkle with sesame seeds and poppy seeds, if desired. Bake until golden brown, about 10 minutes. Cool completely on a wire rack. Look for whole wheat pastry flour in the baking aisle of a well-stocked grocery store. If desired, you can substitute it with 2 cups whole wheat flour + 1½ cups bread flour.